Those settings will keep your 1280 quiet at most salt water beaches on wet sand and still get good depth... On dry sand reduce discrimination to 2 for more depth... Waves hitting your coil on ANY detector will cause noise,including pulse detectors... 8 inch coil 25 cent=8 to 10 inches max.. 10.5 inch coil 25 cent=10 to 12 inches max.. I bought my 1280x many years ago from Kellyco in Florida, back when they were still lifetime warranty. Has proven to be a great underwater detector, only problem I have had is the 9 volt wire that is detachable from the battery pack has broken, I just got it replaced for the 4th time yesterday. All it costs in around $10 bucks for Radio shack to get her going again. Only thing I would change is going to the 10 inch coil, I have the 8 inch coil. Make sure to not run the discrimination too high, you will get chattering. Also, if the headphone volume is too high, the signal can hurt your ears. Sturdy and rugged, this machine will last a long time. I got it used for $500 cad and it's about 8-9 years old. I LOVE IT. It finds tiny tiny stuff(like small silver chain links) and has an average depth with the 8" coil of 7-8 inches. I found $5.89 in coins for 5 hours of hunting. It's a bit hard to discriminate nails but once you get the hang of it it's awsome. I noticed that the coil cable is cracking up, I will probably send it to fisher labs to get the unit fixed even tough it is still waterproof and working great. I bought my 1280X in the early 1980s and it still works like new. I have found enough silver jewelry and modern coins to completely cover the cost of the unit and now paying for my pin pointer. Think about it its late 2015 and they still make the same Unit. With all the modern techno no body has found a reason to change this detector. I would recommend this to any one wanting a serious detector. Simple to use and no LCD screen to eventually go bad. I will put this detector up against 95 percent of the machines made today. I use the 1280 X for water hunting and in wet weather. It is a great tool . I'm a kayaker and I pack the 1280 when on float trips. It does its job and its simple and easy to use. Adjusting the discrimination is the users preference. It's very audible when scanning the ground you can hear the discriminator work as it clicks and pips over the nails and junk. Some people may find this undesirable but I like to hear the ground. 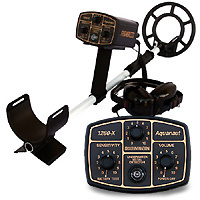 I've used this detector on dry land and in the water with great results. It has plenty of gain on the sensitivity setting to where it becomes unstable and oversensitive. Running the sensitivity just below that point makes it a hot machine. I've dug quarters 12 inch range with no problems. Copper pennies down to 8 inch mark. I would recommend this tool for anyone wanting a waterproof detector. I got a used 1280x off of ebay and used it everyday for two weeks on vacation at Cap Cod. Works great on the beach and land. Has real good depth, very well built and it breaks down nice to put in a kayak. Well that was a plus for me because I put the machine in my kayak and went to a little used beach and found several old coins. Two silver dimes, a few buffalo nickels, wheat pennies and a gold chain which was a nice surprise. I also found an old trash pit from the late 1800s and pulled eight cork bottles out of there. The bad thing about the 1280 is that it is so noisy in salt water that it is a pain to use it. I had read reviews about that but being an old used machine I got a great deal on it. It still found a few old nickels and other odds and ends in the water but no telling what I left behind due to all the noise. I have been told they work awesome in fresh water. The discrimination worked nice also. It would really knock out small iron. Good machine but if you want to get a wader for salt water stay away from the 1280x. Still a good machine to hunt on those rainy days or rivers and lakes. I am only giving it 4 stars due too poor performance in the salt water. I have owned a Fisher 1280X for about 14 years. In those 14 years I have used this machine to find many gold, silver and diamond rings. I have also found many silver coins (Pre 1965) and tons of old pennies plus tons of clad coins. I have also used it as a rain detector for days when it is raining...which by the way is the best day to hunt due to ground conductivity being better when wet. land searching where there is not a lot of trash. It does discriminate but with noise. It will make a chit chit chit noise and not a smooth tone when finding good targets. As far as saltwater and beach hunting goes, It is a great dry sand beach hunter with a fairly good discrimination to let you know if it is a good target or not. I have found a few gold rings down to about 13 inches with the 1280X on beaches. Just stay away from the water line at saltwater beaches. The black sand and the movement of the water under the coil will cause the machine to bark and it is very annoying making the 1280x almost useless. But get this machine's coil totally into the water away from the shoreline and this machine almost acts like a PI machine with discrimination. I really like the idea of being able to submerse the whole machine including the headphones. The 1280X is at home best underwater. You never know when you might trip in the water and get dunked all the way. I have seen guys cover their land machines not designed for water hunting with plastic bags and watched them ruin their machines as they fell in the water. The 1280X was designed for water and for that it is fantastic. That is why I have kept this machine for so long. It is a great fresh water hunter anywhere and a great salt water hunter if you stay away from the shore line. This machine is very easy to use. Just 3 control knobs. Volume, Sensitivity and Discrimination. Very easy to use and understand. That is probably why so many professionals use this machine. Very simple and very effective. The battery life is about 50 hours, 8 AA penlight batteries. I have never had any mechanical problems with the Fisher 1280x. Once you learn how to use the 1280X and what makes what noises, you will find this machine a joy to use. Just remember, use it for what is was designed for and it will reward you with lots of finds. The discrimination control on the 1280x can be set to eliminate the effects of saltwater beaches and still retain good sensativity to all metal targets.Also, because 1280x runs at 2.4khz it will not be as sensatie to small gold chains and rings as a detector that operates at 10khz and higher. The discrimination range of this detector is different to most VLF detectors. Most VLF discriminators are set with a high range metal eliminating capability but the 1280x has an extended low end range from nails through to salt and have a shortened metal eliminating range, a bit like the Whites 6000 DI PRO SL. PS. Interested to know if you are still having problems with this detector?